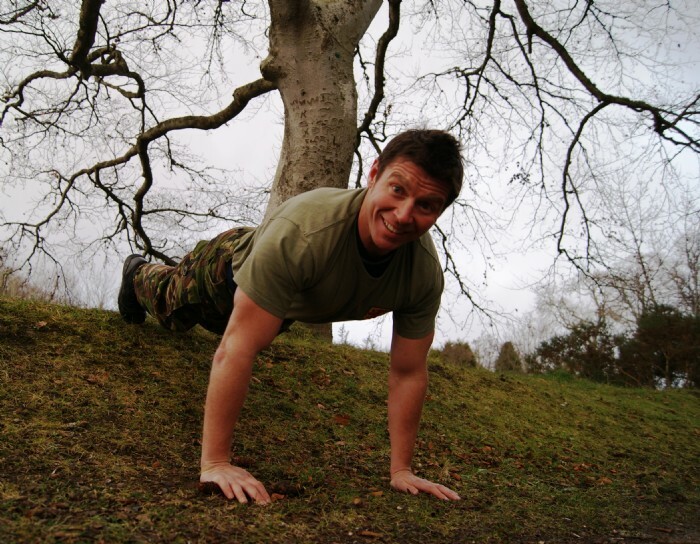 Welcome to Scottish Boot Camp’s Newsletter. We’ve just returned from our April camp, where the weather surprised us with a couple of moments of sunshine after months of freezing weather! 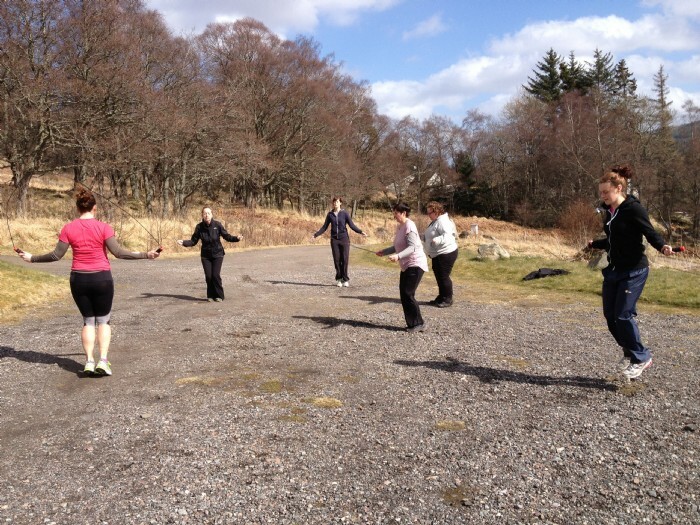 Staff Paddy and Staff L being the ultimate professionals that they are revised the course programme with the ever changing weather conditions, and the girls spent some time indoors on kettle bell sessions, spinning and even a introduction to weight lifting at Gym 300 in Inverness. Staff P also managed to get a few sessions for the girls with RUTH - a female ‘man over board’ body weighing a tonne (well not actually) which was utilised fully at every opportunity by our instructors, and became the source of much swearing and cursing throughout the week. Lileen kept everyone’s spirits up with an inspired menu as ever – and we’ve included her own unique ‘Granola Cake’ fat free recipe to try at home without any guilt (but do remember portion size of course!). 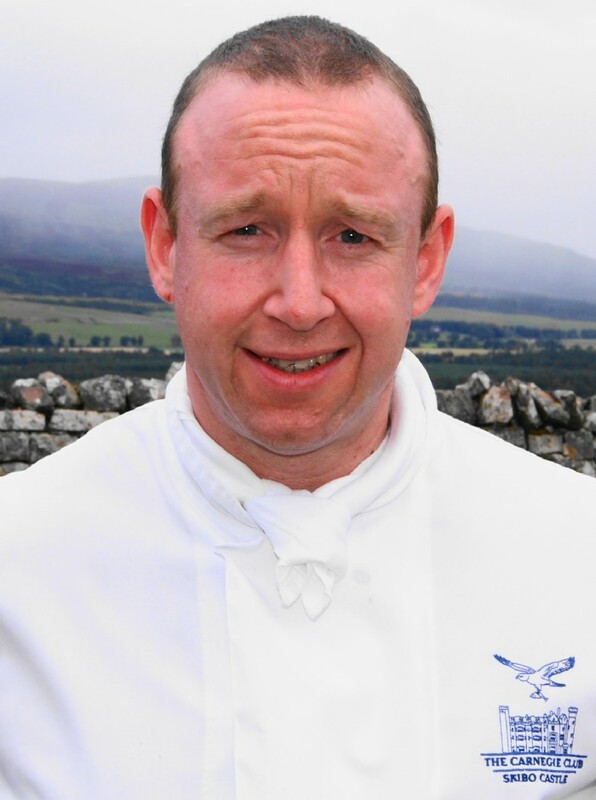 Chief Instructor Paddy's "No Kit Required!" Workout! Stand straight, arms down by your side, then bend knees until hands are on the deck, shoot legs fully to the rear so that your body is fully extended in a press-up position. Shoot knees back in towards elbows and jump up into the air as high as you can! EXPLOSIVE! Lie on your back, knees bent and feet flat on the floor. Left hand on left knee, right on right. Slide your hands up to your knees, raising the torso and return. Remember to contract your abdoms and try not to throw yourself up using your neck- a common mistake! Press up position, arms extended (knees up off floor) legs straight. Drive left knee to left elbow and shoot back, then change with the right side (AKA Mountain Climbers). Don’t forget to warm up beforehand, and to cool down and stretch at the end of the workout. which both proved a huge success for the girls on camp. Bear in mind that Richie cooks to taste, so you’ll have to do the same with your ingredients too. The recipes are actually quite straight forward to reproduce, so try them out at home and let us know how they tasted! Split the chicken breasts butterfly style at the thickest part so that the fillet is flat. Saute shallots and garlic lightly with fresh thyme until soft, then add some washed spinach until wilted and place into tea towel and pat dry, chop finely add spoonful of ricotta cheese and fresh herbs (tarragon, chive, chervil, etc). Spread mix onto breast fillet and roll in cling film (like a sausage). Secure in foil. Bring to boil good chicken stock (about a pint) add some washed spinach, watercress and rockette. Bring to boil again, and blitz with couple spoonfuls of low calorie Crème Fraiche. Season with black pepper, and salt if needed. Blitz together olive oil, garlic, pine nuts, basil, roasted red peppers and sun dried tomatoes. Season with lemon juice with salt/pepper. Add squeeze lemon juice just before serving. 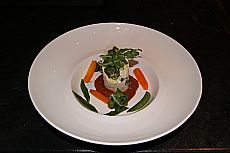 To serve with this dish I would suggest a variety of al dente vegetables. To assemble, cook chicken in boiling water for 14-16 minutes, letting rest for 4/5 minutes. 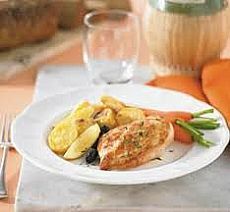 Assemble vegetables on a plate, with a little reheated sauce, slice chicken into 3 or 4 slices, placing on top of vegetables. Add Pesto on top of chicken, garnished with fresh herbs. You will need a nice fresh selection of seasonal berries sweet to the taste, washed lightly and refrigerated. Place a selection into some glasses. Place a punnet of raspberries in cold water with vanilla extract and sugar substitute (eg. canderel) bring to the boil and let sit off the heat for 20 mins. Blitz and strain out seeds. Allow to cool and mix into berries placed in glasses. Place 3 to 4 (very fresh) egg yolks and vanilla extract into a stainless steel bowl and place on bain-marie (water bath) and add small glass of good white wine/champagne and sugar (or Canderel) whisk until mixture reaches ribbon stage. Pour mixture over berries and place under a very hot grill until lightly gratinated. Serve immediately. Place chocolate in pyrex bowl or similar, and sit on a pan of hot water to melt. Let the chocolate melt without stirring too often, as this could cause it to harden. Allow to cool slightly when completely melted. 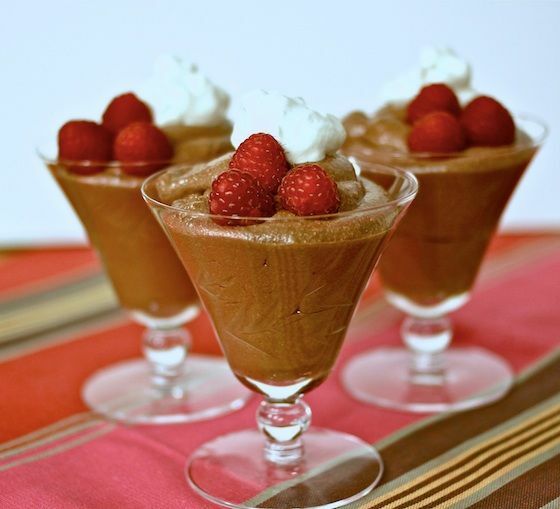 Whisk the egg whites to medium peaks, add all the canderel, whisk again quickly and add chocolate slowly in spoonfuls to start, mix well, then add in another spoonful, mix, then add rest half at a time. Mix well and chill for at least 3 hours. Serve with a teaspoon of creme fraiche to decorate and a couple of fresh raspberries on top. 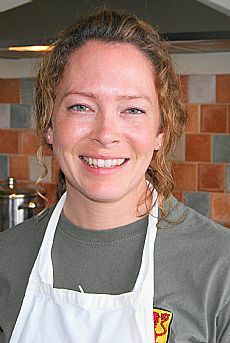 Lileen’s recipes are proving a great success every camp, and are nutritious and easy to follow for everyone. Here are 2 more to add to your menu planning. 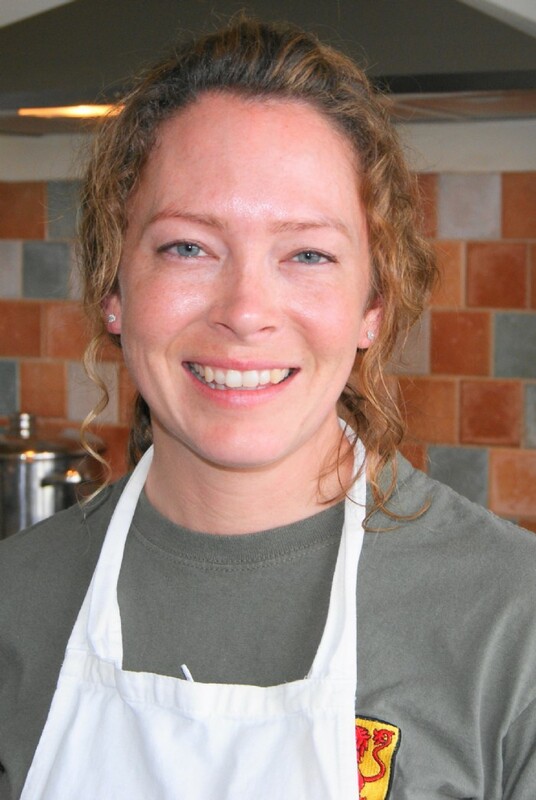 Lileen Esler was hugely successful in delivering our catering on the last camp, and here is some of her tasty easy recipes to try at home. 1. Put the onions, garlic, butternut squash, tomatoes, turmeric, cumin, chilli, cardamom pods, cinnamon, lentils, water and stock cube into a large pan. Bring to the boil, lower the heat, cover and simmer gently for 20 minutes or until the squash and lentils are soft. (Skim any scum off the top of the soup). 2. Remove the cardamom pods and cinnamon stick, then puree the mixture in a blender or use a hand blender. 3. Return to the pan, add the coconut milk (keeping some back for garnish), and add the lime juice. Stir well and season. 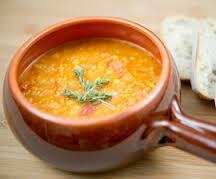 Reheat the soup without boiling (the soup could split because of the coconut milk), and serve in deep bowls. Swirl some of the reserved coconut milk into soup and sprinkle some cumin seeds to garnish. You can use the soup as a sauce and add some Thai red paste, spinach and peas and serve over grilled chicken breast and have with brown rice. 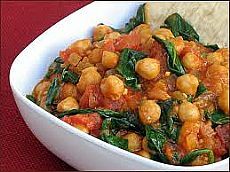 Lileen's Comforting Chickpea & Spinach Salsa! In a pan add 1x tbsp olive, rapeseed or sunflower oil, low heat add onions, garlic, spices and curry paste. Cook until softened. Add the carrots, apricots, squash, tinned tomatoes and stock. Add chickpeas, simmer until soft. Add coconut milk, courgettes, fresh coriander, cherry tomatoes, spinach and cauliflower. Reduce until thick, season to taste! Serve. Note: Add chicken, lamb, kidney beans or quorn during cooking, or diced fish fillet 10 mins before serving! Great all chucked in with meat into a slow cooker ready to have after a long, hard walk out on the hills etc! Yum! 1. Preheat oven to gas mark 7/220/fan 200c, Place all vegetables except sage, basil, tomatoes & spinach in a large roasting tray, large enough for 1 layer. Spray with cooking spray and roast for 30 mins, tossing occasionally. 2. Add sage leaves and tomatoes and roast for further 20mins, or until vegetables are slightly charred. Season. 3. Cook off lasagne in boiling salted water. Cool and cut in half. Blanch spinach and drain. 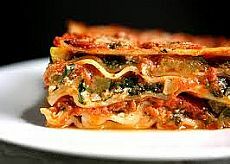 4 On a plate, layer lasagne, veg, spinach and tsps of cottage cheese, drizzling with pesto and balsamic vinegar. Serve garnished with basil leaves. 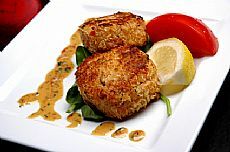 Can be served with grilled fish, white meat or quorn. Preheat oven to 200c/gas 6. Cut small slices into each potato at regular intervals, making sure not to cut right through. Place the potatoes on a baking tray (line with tinfoil to save washing up), sprinkle the chopped garlic into the slices and spray with low calorie spray. Tuck the rosemary into some of the slices. Sprinkle with a little sea salt if you want to. Cook in the oven for 10 minutes. Remove from oven, turn the potatoes and cook for a further 30-40 mins, or until cooked through. Set aside and keep warm. 1. Preheat oven to 240c/gas 9. Place chips in a pan of lightly salted boiling water for 3-4 mins. Drain well, then place on kitchen roll and leave to dry for about 10 mins. Return to the dry pan, cover with a lid and shake to ‘rough up’ the edges of the chips. Transfer to a non-stick roasting tin, spray with low calorie spray and bake for 20-25 mins, turning occasionally. Keep warm. 2. Place the shallots, mustard powder, stock and mustard into a small pan. Whisk to mix well and bring to boil. Reduce the heat, add the mushrooms and simmer for 8-10 mins. Remove from heat and stir in the yogurt and chopped parsley. Season and keep warm. 3. Season the steaks with the crushed peppercorns and a little sea salt. Spray a non-stick pan with low calorie spray and place over a high heat (open a window and shut the door off to the smoke alarm! Haaa Haa! Been there!) Cook the steaks for 5-6 mins on each side, or until cooked to your liking. 4. Divide the potatoes/chips and steaks between warmed plates, drizzle over the sauce and serve with warm wilted spinach! 1. Preheat oven to 180 C / Gas Mark 6. In a large bowl, whisk together the orange juice, orange zest, herbs, oil and garlic. Season to taste. 2. Slash the chicken several times and put in an oven proof dish. Pour the marinade over and top each breast/whole chicken with orange wedges or slices. 3. Cook in the oven for 20-30 mins (chicken breast) or 1 ½ hours (roast chicken) or until cooked through. 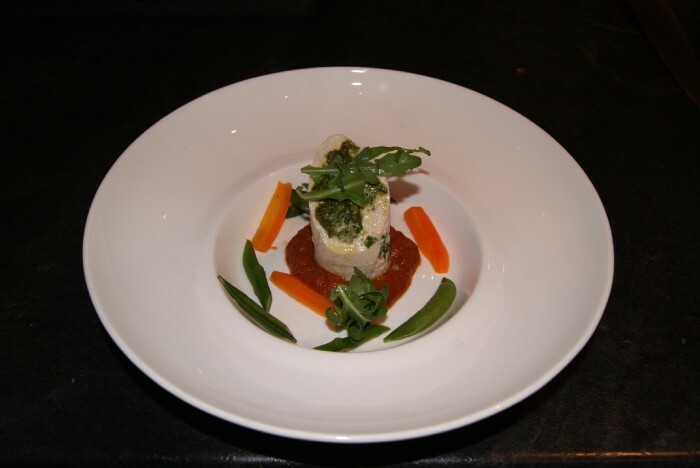 Serve with brown rice and watercress salad, or dry roasted baby potatoes and roast mixed vegetables. 1. Preheat oven to 180 C / Gas Mark 6. 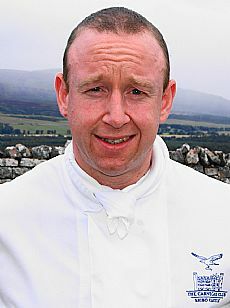 Slice a pocket into the chicken breast and stuff haggis into it. Pan fry breast only using a spray of olive oil to add colour to breasts. Put into an oven proof dish, add a little water, cover with tin foil, put in oven for 20 mins. 2. Using the same pan add another spray of olive oil and add garlic and add the liquid from chicken breasts. Also add pepper and creme freche. If the sauce is too thin it can be thickened with arrowroot. 3. Serve up the chicken breast with green beans, broccoli, and baton carrots and mashed sweet potato. Pour sauce over chicken and serve. 1. Put the crab meat, spring onions, garlic, chillis, lime zest and coriander into a bowl and mix. Add enough breadcrumbs to hold the mixture together, then form into small patties. 2. Heat half tspn of oil in pan. Dredge the patties with flour and fry on one side for 3 mins. Add the rest of oil, turn the patties over and fry for a further 2-3 mins. Garnish the crab cakes with chilli, coriander, lime wedges and salad leaves. 1. Preheat oven to 140c (or 120c fan oven) or gas mark 1. Put the oats, nuts, wheatgerm or rye flakes, and all the seeds in a bowl. Gently heat the oil and honey in a pan. Pour over the oats and stir to combine. Spread on a shallow baking tray and cook in the oven for 1 hour or until golden, stirring once. Leave to cool. 2. Transfer to a bowl and stir in the dried fruit. 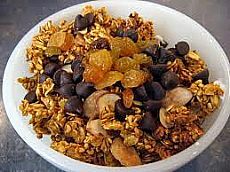 Store in an airtight container- the granola will keep for up to a week. Serve with milk or yoghurt, and sprinkle with cinnamon. 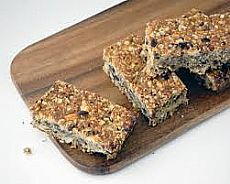 Lileen’s Granola Cake – Fat & Sugar Free – Tuck in!! Lileen always bakes a fabulous healthy Granola Cake during the week on camp, which proves to be a great pick-me-up for the girls when they’ve been working extremely hard and need some ‘comfort food’. Really simple to make, portion it up when baked and tuck in when you need a lift without the need to grab a bag of crisps or bar of chocolate with no nutritional value whatsoever. Go ahead, it’s guilt free!!! 4. If dark on top, cover with tin foil and carry on cooking for about a further 30 minutes, but don’t allow to dry out. 5. Put knife into the middle, if the cake sticks to it cook for a little longer. If the knife is clean, it’s ready! 6. Allow to cool slightly, then slice up into portions, freeze some if needed, and keep in sandwich bags in the freezer. This cake is a small meal as everything you would have in a bowl of porridge is combined in this cake. It equates to a small meal in itself or a snack – not to be over-indulged. Enjoy!! I recently went on a kettle bell course, and discovered what a fantastic piece of equipment they are. Sure enough, I'll be bringing them to camp to incorporate them on our conditioning programmes so beware! 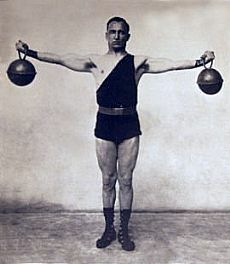 Regardless of whether the exact origin of kettlebells was in Scotland, Greece or Russia (I'd say Russia), the history of kettlebells, as a training tool, dates back over 150 years when they started being used as a form of training by strongmen and wrestlers (not Big Daddy). Later it became a competitive sport in the late 40s in Russia and has progressed form there. In recent times, various institutions and top sports-scientists have conducted a wide range of studies. The general conclusion is that the kettlebell is the single most effective tool for developing strength and endurance as well as for functional based training/toning. Kettlebells are currently used by military and special forces, police, olympic athletes and pro sports teams as the training tool of choice for producing unparalleled results. The kettlebell is a cast iron ball with a handle attached to the top. Unlike a dumbbell, the centre of mass is outside the handle. This means that the kettlebell is constantly pulling away from you. Consequently, your whole body has to compensate and stabilise, recruiting just about every muscle-group to work together. With certain exercise the body has to develop, overcome and absorb momentum, increasing cardiovascular fitness, muscular endurance, strength and power. Explosive olympic lift exercises are also performed with the kettlebell. This takes advantage of the positive transfer effect these movement patterns have for athletic and sports specific training, as well as general functional movement patterns that are used in everyday life. Body Mass Index – is it an accurate gauge for whether you’re overweight? Body mass index (BMI) gives us a general indication of a person’s bodyweight relative to their height. In theory, the higher your BMI, the greater your risk of developing obesity and associated metabolic disease like diabetes, high blood pressure and cardiovascular disease (heart disease or stroke). How valid the use of the body mass index is constantly being debated. 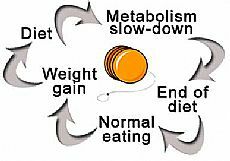 One school of thought is that it is quite limited because it does not take body composition into account (i.e. how much fat compared to muscle you have). But there is definitely a value to BMI provided it is related to an individual’s overall picture of health. For most of us, BMI will give a reasonable indication of health risk. However, if you have an athletic build with muscle making up a high percentage of your body weight, it may indicate a health risk where none actually exists. However, from a general health standpoint, BMI can be used as a quick rule of thumb for assessing large numbers of people with minimal equipment – just reliable scales and height charts. BMI is defined as your bodyweight in kilogrammes divided by your height in metres squared (kg/m2); 18.5 – 24.9 is considered average. Although you should never use a single clinical value to assess your health risks, it’s fair to say that most people with a high BMI are at an elevated risk of developing full-blown obesity, however it is vital to put BMI into context relative to your overall medical history. Sports bras should be made a compulsory part of the PE kit for females participating in physical activity, according to a new campaign. The Breast Health Education Programme is led by scientists at the University of Portsmouth and Sweatshop, and aims to educate young women regarding the importance of breast support and bra selection. The programme’s findings suggest that inadequate breast support may affect the forces produced by a female runner, which could impact negatively on sports performance. Therefore a well-fitted, supportive sports bra is recommended for all women when they exercise to help reduce breast movement and increase breast comfort, which may ultimately improve sporting performance. If you’re the type to binge on exercise for a couple of weeks only to stop and then try again at a later date, then you’re probably a yo-yo exerciser. Try these three simple tips to help keep you on track. Set yourself a definite goal – Instead of an ambiguous, “I want to lose weight” you should rephrase this as, “I want to lose 3 stone (19kg) of stored body fat over 20 weeks.” Healthy fat loss is approximately 1 – 2lbs per week (1/2 to one kilogramme), so 20 weeks should be ample time to burn it off in a safe and effective manner. Physical activity loves company – Research indicates that social engagement during exercise enhances enjoyment and increases the likelihood of sticking with it. Snip the yo-yo exercise string by getting your friends, family or co-workers on board and hold each other accountable. Keep going to group exercise classes and make new fitness friends. Talking with them about health and fitness keeps your head in the game and helps maintain momentum.